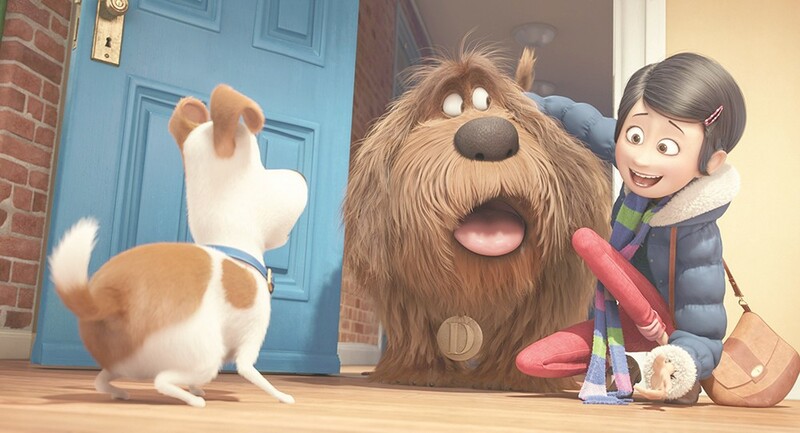 The Secret Life of Pets explores what your dogs and cats are up to when you leave them at home. What do our pets do all day while we're at work or school? Mostly sleep, probably. Unless you have a Bad Dog or a Bad Cat, in which case the torn-up sofas and puddles of vomit you return to are already pulling back the curtain of mystery on their daily doings. So best consider the charming The Secret Life of Pets more an animated fantasy than a documentary, in case you were in any doubt. Visually, Pets is gorgeous, giving us a small animal's perspective on the Big City, all looming skyscrapers in the distance and cozy apartment houses up close, as well as some wonderfully silly Looney Tunes-esque cartoon shenanigans. But it's the wistfulness of Max's longing to get home to Katie that makes the movie sing with sweetness, as does the devotion to get him home displayed by Max's friends, other neighborhood pets such as Gidget the fluffball handbag dog (the voice of Jenny Slate, who just about steals the show), and Chloe the cat (the voice of Lake Bell). The Secret Life of Pets and The Secret Life of Pets 3D are not showing in any theaters in the area.